A corny old t-shirt reads ‘Singapore is a fine city’ and then lists the fines for chewing gum and other things the city state prohibits. Apparently, Singapore now also prohibits going there too often as one Baguio resident found out when he was detained at the airport for visiting his girlfriend one too many times. Arnold (not his real name) said when he arrived in Singapore, airport officials brought him to a room and repeatedly asked him why he kept coming back to Singapore. Arnold has been in Singapore thrice to visit his girlfriend and added that in all of his visits, he always came back before his visit visa expired. Arnold said it was his first time to be questioned by airport officials. Despite assuring the airport officials that he has plans of returning because he is studying, they still detained him for eight hours and repeatedly asked him the same questions. Arrest you for being a tourist, can! He was not allowed to contact the Philippine consulate or even to use his mobile phone. Singapore airport police told him they would contact his girlfriend to tell her he was being detained but they did not do so. I guess that was so he wouldn’t have a girlfriend to visit in Singapore anymore. current events	 detained, public order, singapore, tourism, wtf? Interesting, did the guy able to come back to the philippines? @Tony: Yes, he was. But not before SG airport cops searched his baggage and inspected the jars of ube jam he brought with him. I don’t know if he was able to see his girlfriend or if they’re still together at all. HA!HA!HA! Because Filipinos has this criminal looks. Or, maybe they have a corrupt viruses that may spread in Singapore. OK, here is the answer. He was not DETAINED! He was QUARANTINED!!!! Because of mental issues, which is a pre-existing condition among Filipinos. The mental issue was LEARNING DISABILITY!!! The Singaporeanese just want to make sure the Filipino is not marrying a Singaporeanese afraid their factory-defective DNA might spread. Now the story becomes boring. A one of? It’s not like they’re doing this to all Flips that come there is it? @Renato: Dude, you have to stop hating on your own kind. Making fun is fine when you have a point to make. But saying stuff like Filipinos have defective DNA is a bit creepy. @Anonylol: Naw, it’s probably just an isolated incident. It was just weird that they picked him up for going there too often. When you think about it, it is a bit strange. I mean, from a security guys point of view. This guy has been there thrice and in a short span of time. Raises a lot of flags. 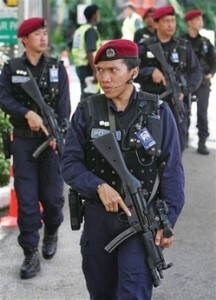 I don’t think it was the hostage thing that got the SG authorities jumpy. I think it was how one of our congressmen was caught with a shitload of drugs. @Anonylol: Good point. I’m also thingkin it might be because of that Singson’s drug case. Oh man, I really hope they didn’t find anything on him or even any evidence that he is doing it. We really don’t need another one right now. @Anonylol: Be not afraid. That story came out in Sun.Star Baguio, so the kid at least got home to tell a reporter about it.